Drain pineapple, reserving 1/4 cup juice. Set pineapple aside. In a small bowl, combine reserved pineapple juice, soy sauce, oil, onion, garlic and brown sugar, mixing well. 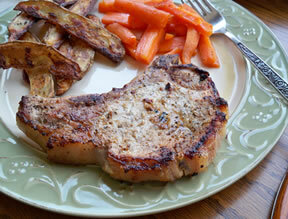 Pour mixture over pork chops, cover and marinate in refrigerator at least 2 hours. 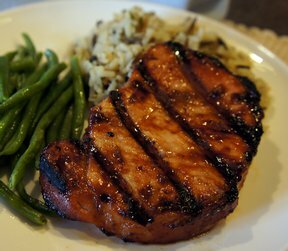 Remove chops from marinade. Grill over medium heat 30-35 minutes, turning frequently. 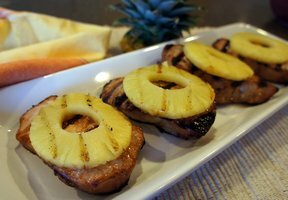 Place a pineapple ring on each chop during the last few minutes of cooking time. 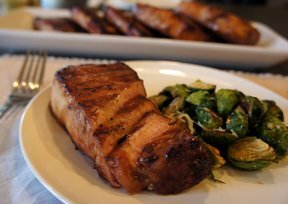 "The pork was juicy and we really liked the flavor. We skipped the pineapple just because we aren't warm fruit fans. We will definitely make this again."